Touch And Sew: Still Alive! 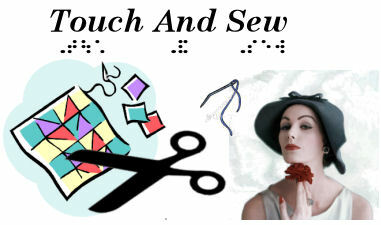 How to sew a straight line when you're blind or have low vision, and other adventures. Follow me as I try my hand at sewing after 25 years, beginning with quilting class . My oh my, you probably think I've died after my last post back in November 2014 and no update since! I'm very sorry about that. So in 2014 I had had 2 sessions of chemotherapy — half doses were all my new kidney would tolerate so in total I had effectively one dose. At that point they decided not to stress the kidney (or me) with more chemo. In February 2015 I had a fairly short session of radiotherapy, 17 sessions, one each weekday. And that was that! I was very tired and a bit down having gone through all that, but by July 2015, a year since I fell down the house stairs, I was ready for the follow-up brain MRI scan. It showed no residual signs of the lymphoma, yay! Afraid to say I still haven't quilted anything to report of. What I have been focusing on, second half of 2015 onwards, is my poetry writing. I've written poetry for 25 years now, since my later teens, and I've occasionally talked about it on this blog. With the encouragement of poets and editors that I know I've had a website designer set me up a new website, Giles Turnbull Poet. It became active about 6 weeks ago, but I am aiming to do a blog post on the site once per week. I have to be careful about adding poems that have the potential to find homes in magazines and competitions, so only extracts of 1 longer poem appears on the site at the moment; I will figure out some other extracts that could go on the site, plus there have been a couple of publications alrady during 2016 — I reached the shortlist of Cinnamon Press single poem competition, and publication in Rockland Magazine and Fair Acre Press' Maligned Species project with a poem about stinging nettles. This week I have been writing articles on blindness and poetry for Corncrake Magazine in Ireland, and for the forthcoming summer issue of Poetry Wales. You can still find me on Twitter and I'm still on Facebook. Best opening paragraph ever! Sorry but it really did make me laugh!! Great to hear from you again. Oh Giles, how lovely to have you back and in good spirits too. What a journey you have been on!I have been keeping an eye out for you over the previous months but thought it best to leave you in piece to recover. I shall most certainly check out your website to read through your poetry, another passion of mine, though reading it is more in m y line than writing. I grew up on poetry read to me by my Grandmother. I now have a lovely new sewing room which I am grandly calling my 'studio', its so inspiring to have more space and lots of lovely storage. you can follow my progress on my blog. Good to hear from you again, so glad you have reappeared. Keep coming back! Hi Giles! It's great to hear that you are doing well. I will be popping over to your poetry blog and will keep track of you there too. There isn't much quilting going on for me either but I still do plenty of other sewing projects and do a lot of crochet too. I agree with Sarah - best start ever to a blog post! Did you know that you can get these ON AUTO-PILOT AND ABSOLUTELY FOR FREE by registering on You Like Hits? Magpie Mimi at Magpiemimishop on Etsy, click the button to go to the shop! I've spent my life burried in books and writing. I'm a poet at heart. I co-founded a music magazine and still write about music. My mission for 2011 is to learn quilting, felting and hat making. I want it to be a creative year. I'm pretty much blind, having very low vision now, so lets have a big thumbs up for things like assistive technology and audiobooks; they make the whole reading thing so much easier!